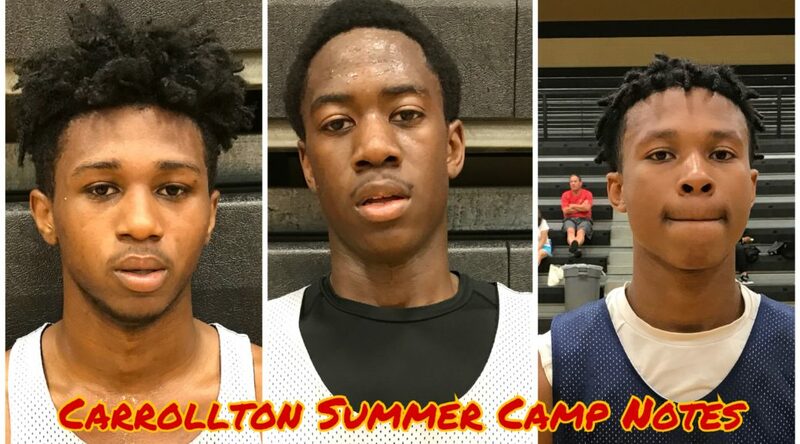 Coming off of a 15-11 season with an 8-8 record in Region 7-AAAAA, there is great reason for optimism for a young Carrollton program that loses just two seniors. In their 13-point win over South Paulding, two rising juniors proved to be the best players on the floor. 2020 6-4 SG Marcellious Lockett is a household name in West Georgia for good reason. Lockett should see his name seep deeper into Metro Atlanta and statewide as one of the tougher covers in the junior class. Lockett poured in 24 points, 2 rebounds, 2 assists and 1 steal. He exploded for 15 points in the second half, part of a stretch of three three-pointers in succession. Lockett can slash to the basket and even showed a nice baseline spin out of the post. 2020 6-6 F Melvin Edwards drips with intrigue at the combo forward position. It was eye-opening seeing his touch from the outside as he nailed three trifectas en route to 19 points, 10 rebounds, 1 assist, 1 steal and 3 blocks. Edwards floats around from the post to the wing, doing most of his damage working his way from the outside. He caught two lobs, throwing one down with authority on the fast break. While I wouldn’t call him an elite rim protector, Edwards did use his bounce to swat away three shots. His ability to play inside-out paired with the versatile scoring of Marcellious Lockett makes the Trojans look like a future playoff team. 2019 6-1 G Sha’mi Shields never seems to disappoint with his energy. While others’ legs were tired, Shields was the energizer bunny, crashing the glass despite his average height and winning 50/50 balls for the Spartans. Shields finished with 12 points, 9 rebounds, 1 assist, 2 steals and 1 block. The offense will never run through Shields and he may not average double-digits his senior season, but instead, he is a willing glue-guy that will do a little bit of everything — not needing to be asked – to make plays that win games. 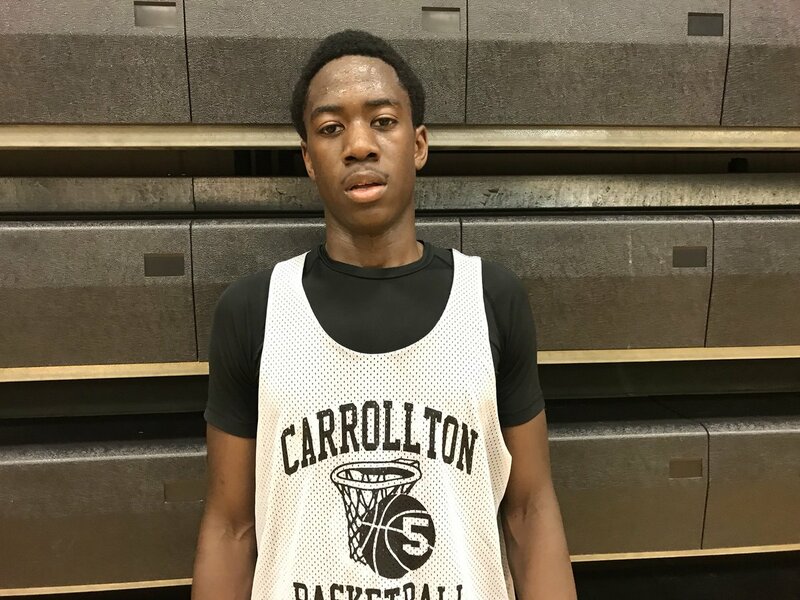 2019 5-10 PG Shane Gibson performed well in the South Paulding backcourt, serving as one of the Spartans’ most reliable ball handlers against an aggressive trapping Carrollton defense. Gibson calmed down the offense and was able to initiate their sets. The lefty netted a team-high 13 points to go with his 2 assists and 2 steals. Graduation and the offseason transfer of Malik Battle has left Douglas County searching for a new go-to guy. 2019 6-5 F Jeremiah Smith was the Tigers’ most consistent player on Thursday, finishing with 10 points, 5 rebounds and 1 assist in Game 1 against Troup County before posting 10 points, 7 rebounds, 1 assist, 1 steal and 1 block in a loss to Sandy Creek. Smith is a tweener forward that likes to play on the wing more than on the block. He has good physical tools, but he seems more valuable as a power forward that drifts out to the wing on occasion instead of a small forward that rarely goes to the post. Either way, Smith is an athlete that will compete on the glass and provide a strong presence that opponents will have to account for. 2021 6-5 C Omarion Smith is the spitting physical image of his older brother Jeremiah, both with an enviable frame complete with broad shoulders and long arms. The Lithia Springs transfer is one of the best rim protectors in his class, blocking over 6 shots per game last year. He blocked 4 shots total on the day and grabbed 7 rebounds against Sandy Creek. Smith still has work to do on offense. He needs to develop a go-to post move in order to become more than just a shot blocker. He has the length and explosion to elevate over and finish through defenders, he just has to put in the time to be able to do so. With seven varsity players out because of football, the young and physically immature Tigers had no business sticking with Douglas County, but the scrappy bunch fought tooth and nail and gained valuable experience for the future. Troup County was outsized at every single position, but that did not stop them from playing great team defense and clogging the lane whenever Douglas County attempted to beat their man off the dribble. 2019 5-10 PG Quevo McFarland provided veteran leadership and quick ball handling. The lefty finished with 13 points, 5 rebounds, 1 assist and 2 steals. His speed kept Douglas County off balance and attacked in the right spots. 2019 5-11 PG Brandon Smith didn’t score much, but he controlled the tempo when he had the ball. Smith had the game-tying assist at the end of regulation after racing the ball up the floor. Smith has a sturdy build and uses his physicality well. He had 2 points, 7 rebounds, 4 assists and 3 steals against Douglas County. 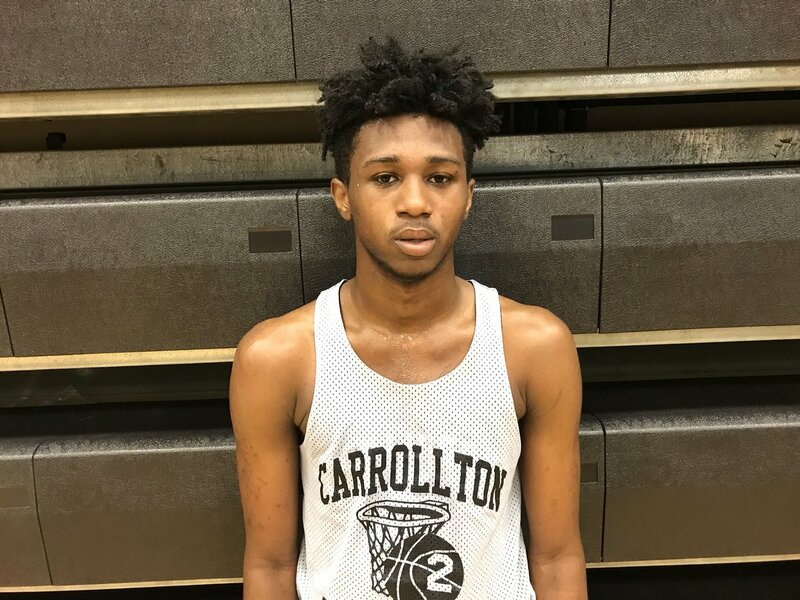 2020 6-2 SG Gabriel Cofield has to work on his handle and get stronger, but he flashed in a big way for Troup County, netting a game-high 14 points including drilling back-to-back threes to keep the Tigers in the game. 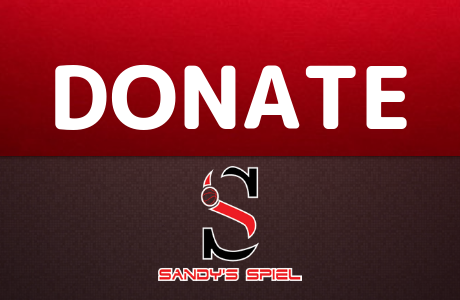 Cofield has a confident jumper that could make an impact in spurts on the varsity level. As he grows into his body and gets more reps with the big boys, Cofield could develop into a nice high school player. 2019 6-4 SG Julian Alexander looks primed for a breakout senior season similar to that of Jarred Godfrey. Alexander was smooth as silk against Douglas County, getting to the rim with finger rolls while also finding the time to drop in four three-pointers. He collected 4 rebounds, 3 assists and 2 steals. Alexander looks like the No. 2 option behind TJ Bickerstaff heading into the 2019 season. 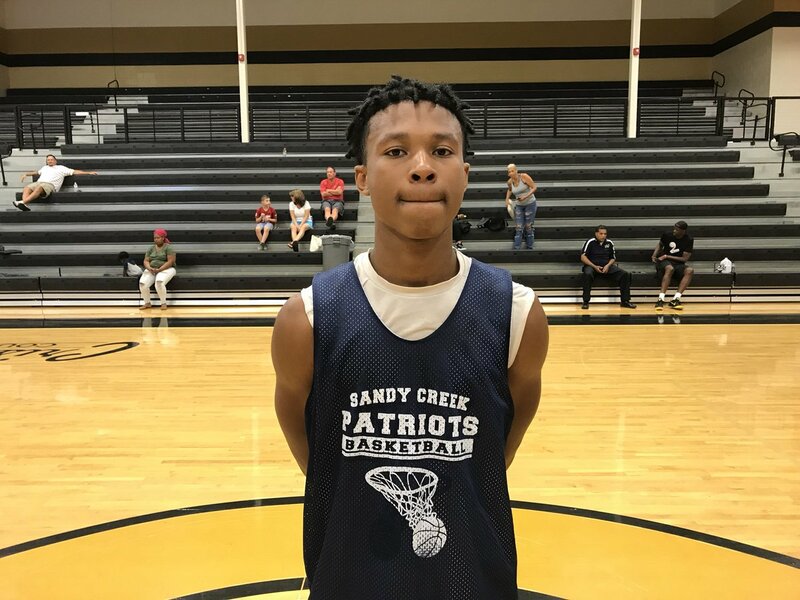 Sandy Creek will have plenty of youngsters play big minutes this upcoming year, but the veteran backcourt of Alexander and Bickerstaff will undoubtedly be the straws that stir the drink.